: Colourless or pale yellow oil with a very sweet, but slightly spicy aroma. : 0.95300 - 0.97300 @ 25 °C. Also known as Common Fennel, Fennel is an erect growing perennial herb native to southern Europe and the Mediterranean area. Reaching a height of 1.5 meters (approximately 4.5 feet), the plant has yellow flowers. Fennel is a biennial or perennial herb, with green feathery leaves and golden yellow flowers. The plant can grow up to 2 meters in height. Fennel sweet oil has herby, slightly spicy smell, much like aniseed and it is clear in viscosity. It is organically cultivated and is "Indian Organic Certified". The main chemical components of this oil are a-pinene, myrcene, fenchone, trans-anethole, methyl chavicol, limonene, 1,8-cineole and anisic aldehyde. A top note with a medium aroma, Fennel Sweet Essential Oil has a similar to that of black licorice. 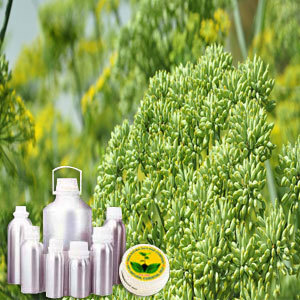 The Fennel Therapeutic Grade Oil is widely used for its therapeutic properties and helps in congestion, sinus and cough. It is also useful in digestion, gout, lupus, menopause, rheumatoid arthritis and weight loss. With its slightly spicy smell, it is also used in deodorants, perfumes, home cleaners and various facial and skin care products. Fennel Therapeutic Grade Oil recommended due to its various therapeutic properties which include - Antiseptic, anti-depressant.